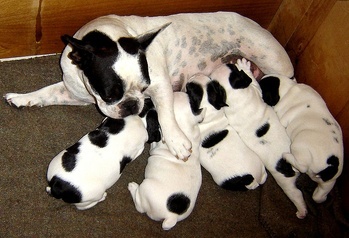 Paw Print Genetics often gets asked about an optimal time to swab a new litter of puppies. When reviewing these tips, please keep in mind that it can take up to two weeks to obtain results once Paw Print Genetics has received the swabs. Therefore, allow plenty of time for the laboratory to process your samples before promising a specific date that the puppy can join its new home. Puppies and dogs can be tested at any age. However, it is a good idea to allow the puppies to stabilize after birth, bond with their mother, and demonstrate that they can feed and grow before testing. You do not have to wait until the puppies are weaned; once the puppies are stable and thriving, they can be swabbed. For puppies that are not weaned, the puppies should be separated from their mother for at least two hours prior to swabbing. This is to ensure we get the DNA of the puppy instead of the mom's DNA. During this time, they should have plenty of water and should not be allowed food to avoid contamination of samples. Once the swabbing is completed, the pups can rejoin their anxious mother. For buyers of a new puppy that has not been screened for inherited diseases, it is best to request that the breeder order the testing prior to you taking possession of the dog. Once that puppy is home with you, if significant health concerns arise during the genetic testing, it maybe emotionally difficult to return that dog. If you have a dog that reached significant maturity and you have decided to train it as a hunting dog, for the agility ring, or perhaps as a guide or assistance dog, having a genetic screen prior to training provides more confidence that the dog will be able to perform its work well into the future. Thinking of breeding? Both the sire and and dam should be screened for genetic mutations known to affect their breed prior to breeding. Even though the owner of the dam or sire know their lines, there are so many new genetic mutations being identified for inherited diseases in dogs, it is prudent to check the Paw Print Genetics website by searching your breed to see if there are any new tests available. Because many of the inherited diseases in dogs are recessive (meaning that two copies are needed to produce the clinical signs of the disease), genetic mutations can lay silent in carriers for many generations until the “wrong” pair is mated and affected puppies are produced. Although we all like surprises, this is one surprise that is easily avoided through genetic screening using the panels offered by Paw Print Genetics. We understand that your dogs are an emotional, financial and time-consuming investment. Whether breeding, buying or training, you can protect that investment through genetic screening. Find out what’s new in the New Year in your breed by searching the Paw Print Genetics’ website. Let Sleeping Dogs Lie, or Test for Narcolepsy? My Dog is Better at Computers Than I Am. How Do I Place an Order at Paw Print Genetics? Rickie Roo's Story - Could this happen to your dog?